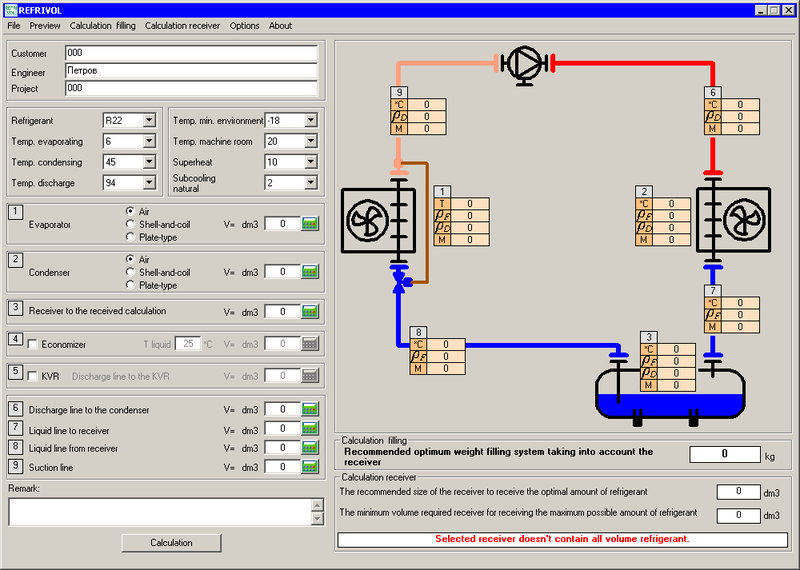 Calculation of the optimum refrigerant charge. - Volume of the receiver for receiving all refrigerant. - Saving a list of equipment for billing. Mathematical calculation allows the most optimal calculation of the required amount of refrigerant for the stable operation of the plant. The calculation is based on calculating the required refrigerant mass in the individual plant elements from the ratio of the vapor-liquid refrigerant filled to the total volume of the element, which allows to take into account the different states of the refrigerant at different temperatures and pressures. • Current version: Version 5.0 • Release date: 04.06.2015 • Trial period - 7 days.